Sadly, Apple isn’t allowing Kodi to appear on the iOS App Store. However, this isn’t stopping Kodi’s developers from offering a workaround. In fact, Kodi for iOS receives frequent updates, along with other versions of this application, and we’re sure that many fans of Apple products use this home theater software. So the question is – how to install Kodi on iOS in 2019? We’d like to highlight the fact that you don’t need to have a jailbroken iOS device. Instead, we focused on coming up with two solutions that are perfectly safe for your device. And, we want to teach you how to install Kodi on iOS in the fastest way possible. Before getting to our installation methods, it’s a good idea to review the following set of requirements. So, take a quick look and which iOS devices can run Kodi 18 Leia – the latest available version of Kodi. 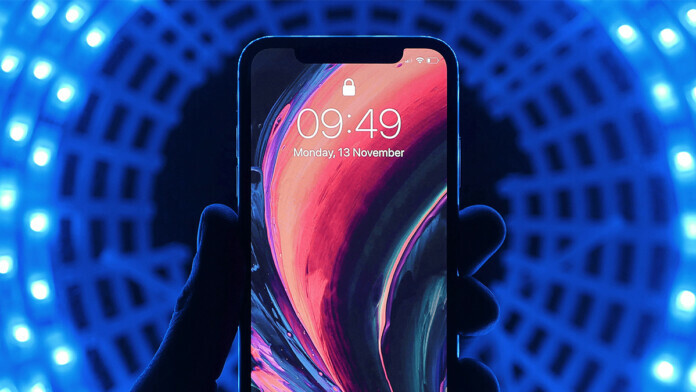 First, we will be talking about a method that applies to Windows, Mac, and Linux – as Cydia Impactor can be downloaded and used on all those devices. In addition, you need to have iTunes installed on your computer and have it paired with your iOS device. And finally, you need to have an Apple ID or a paid Developer ID. Once you’ve met all of the requirements, you’re ready to proceed. Here’s how to install Kodi 18 on iPhone or iPad using Cydia Impactor. First, you need to launch Cydia Impactor. Connect your iOS device to your computer using a cable you’ve received with your device. If iTunes launches, close it. Now download Kodi for iOS on your computer from here. What you’ll download is a DEB file – and we need an IPA file. To learn how to convert this file, check out this Reddit tutorial. Now, drag-and-drop Kodi’s file onto the Cydia Impactor window. This is also where you’ll see a drop-down list of iOS devices. Make sure to pick your device from the list. The application will ask for your Apple ID credentials, needed for Kodi to be successfully installed. Feel free to use your Apple ID and Cydia Impactor will let you know if everything’s okay. As you’ll see, the process of sideloading doesn’t take long. You’ll be notified once everything is done. It is as simple as that to install Kodi on iOS. You should see this app’s icon on your phone or tablet. Before you start using Kodi, there’s one important step to go through. Feel free to disconnect your device from your computer. Now go to the Settings app and navigate to General > (Profiles &) Device Management > Apple ID. This is where you can check out IDs associated with certain applications. Finally, click on an option that allows you to ‘trust’ that ID. This will make Kodi run on your iOS device without any issues. The majority of users who install Kodi aren’t developers and they are using free Apple IDs. This allows you to use Kodi for up to seven days. After that, you need to reinstall it. In case you have a Developer ID, this process needs to be done once a year. Now, let’s talk about how to install Kodi on iOS – if you have a Mac computer as well. Here are all the applications that you need to have installed. iOS App Signer – this is a freebie app. Use the provided link to download it to your Mac. After you’ve downloaded this file, feel free to unzip it. Download the latest version of Kodi on your iPhone or iPad from here. 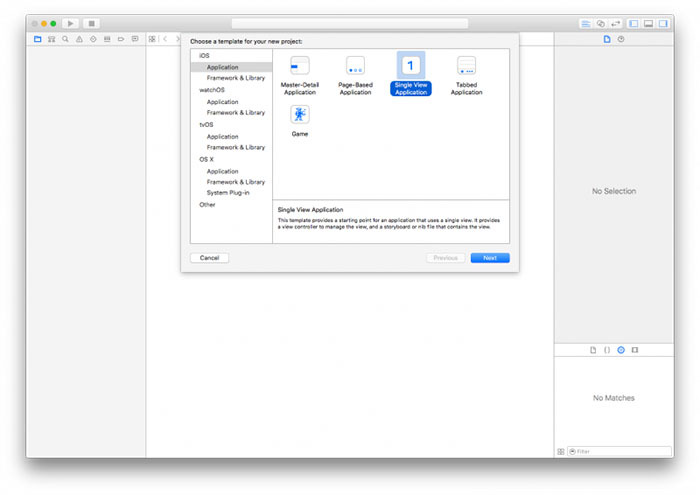 Launch Xcode on your Mac and follow the guide carefully. We have also provided a set of screenshots to help you navigate through this process more easily. 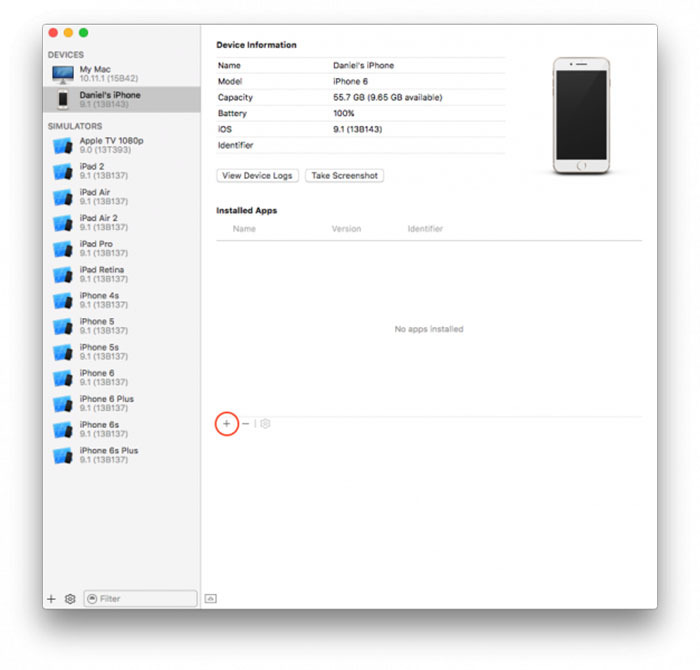 First, plug in your iOS device (iPhone, iPad, or iPod Touch) and open Xcode. Now select ‘Create a new Xcode project’. In the pop-up window, you’ll see a bunch of different options. In the left-positioned side within this window, pick ‘Application’. On the right side, pick ‘Single View Application’. Now click on the button that says ‘Next’. You will be greeted with a new dialog box. You’ll need to fill out fields like Product Name and Organization Identifier. You can name your application Kodi, and fill out other fields as you like. You’ll be also asked whether you want to create the app for iPhone or iPad, but you can pick ‘Universal’. Hit Next when you are ready to proceed. Now you’ll need to pick a location for a new GitHub repository. You can save it on the desktop. Click ‘Create’. You’ll be asked if Xcode can access your contacts. There’s no need for this, so feel free to deny this request. You should be greeted with a fairly complex view of Xcode. Somewhere in the middle portion, you will see a message that reads: ‘No code signing identities found’. Click on Fix Issue just below this message. This is where you’ll be asked for your Apple ID account. Fill out your credentials and sign in. 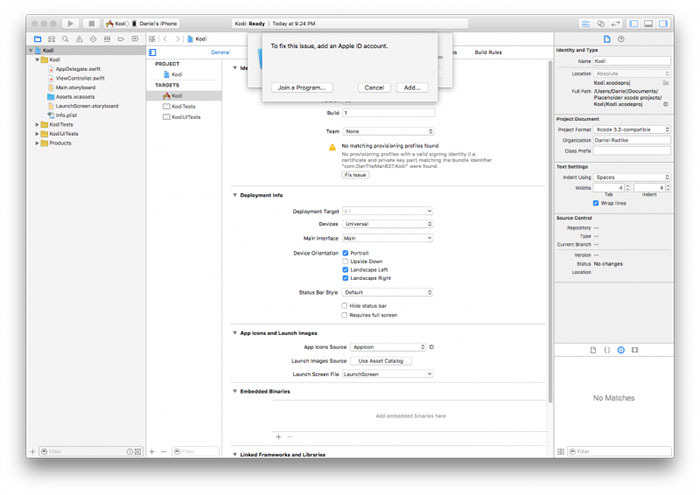 Once you return to Xcode’s main screen, another error will appear. It will say ‘To fix this issue, select a Development Team to use for provisioning’. By default, there will be only one team that you can select, so you can proceed. After a couple of seconds, Xcode will successfully fix these errors. What you need to do now is to open the iOS App Signer application. Once you open it, you will see a list of different fields. The first one is called ‘Input File’. This is where you need to locate the Kodi IPA file. Fields like Signing Certificate and Provisioning Profile should already we filled out since we have done that a moment ago using Xcode. 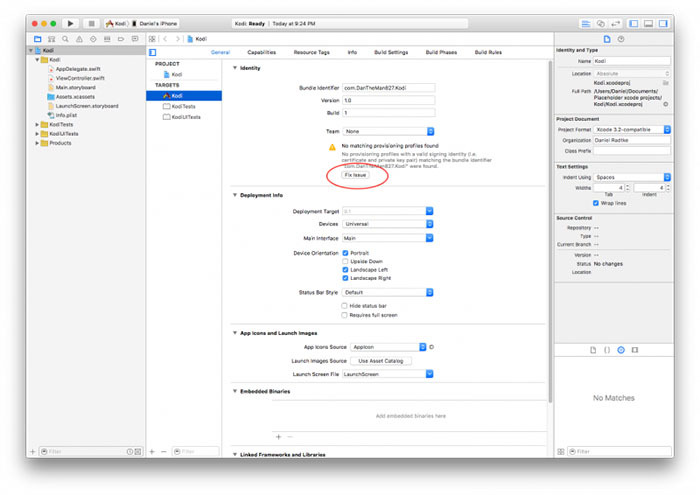 If now, you use the drop-down menu and pick the ones you picked in Xcode. Finally, there’s the App Display Name field. This is where you can name your app ‘Kodi’. After you install Kodi on iOS, this name will appear underneath the app’s icon. Once you’ve set up everything within iOS App Signer, hit ‘Start’. The application will now unpack the data and save your newly generated Kodi iOS app. You’ll be notified when the process is completed. 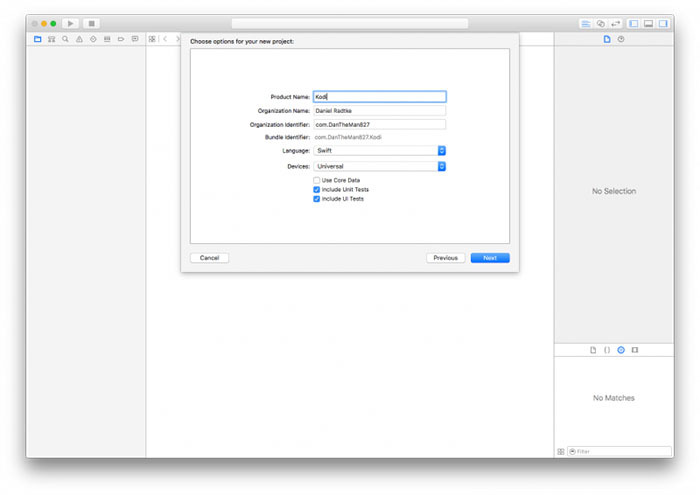 Return to Xcode and select Window > Devices from the system menu (top portion of the screen). Find your iOS device in the left-positioned sidebar. In the main portion of the window, you’ll see a bunch of different details about your device. Scroll down until you see a small plus sign. Click on this sign. Navigate to the newly generated Kodi iOS app on your computer and hit Open. After a couple of seconds, the process will be done. Kodi should now be listed in the section named Installed Apps. That’s all when it comes to Xcode and your computer. Feel free to disconnect the device and remove any cables. We hope that by now you managed to install Kodi on iOS. However, there is one additional step that is done on your iOS device. We need to instruct iOS to ‘trust’ this application so we can open and use it. In the majority of cases, you’ll see a warning that Kodi cannot be opened. This is why we need to go to the Settings app > General > Device Management. This is where you can use verify Kodi under Developer App section. Tap on the Apple ID account you used in Xcode. Click on the option that allows you to ‘trust’ applications associated with this account. Kodi should be listed in the lower portion of the screen. That’s how you install Kodi on iOS! You can go back to the Home Screen where Kodi will be waiting. Tap on it to launch this amazing app. We sincerely hope that by now you have managed to install Kodi on iPhone or iPad in 2019. As you can see, this is a true example of Apple’s restrictions. Due to its nature, Kodi cannot find its place in the App Store, even though it’s one of the best apps of its kind. Luckily, there are different methods to install Kodi on iOS without messing up with jailbreaking. With Kodi running on your iOS device, it’s to learn how to use this amazing application. For this purpose, we’ve collected a set of our popular guides, so take a look. If you think that other Kodi users would like to read this article, why not share it online? Also, don’t forget to follow TechNadu on Facebook and Twitter. Thanks!